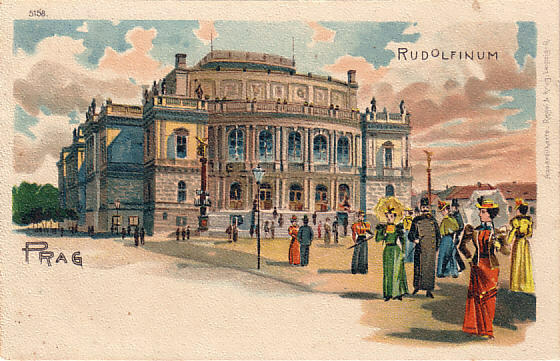 Built 1876-1884 by Josef Zítek and Josef Schultz as a concert hall and art gallery. Named in honour of the Austrian crown prince, archduke Rudolf von Habsburg (1858-1889) who was present at the opening ceremony. 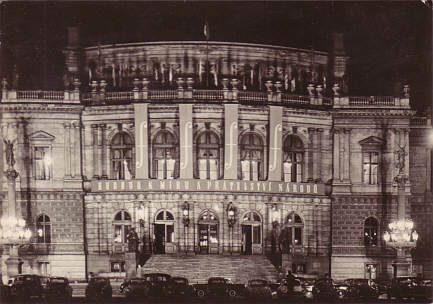 Concert hall "Dvorákova sín" named in honour of the Czech composer, Antonín Dvorak (1841-1904). Opened 8 Feb 1885. 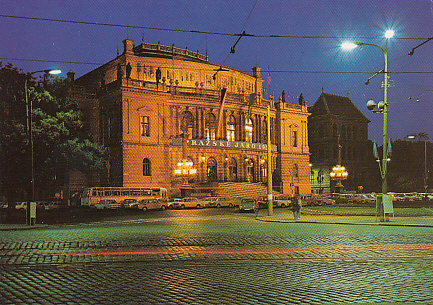 Since 1896, home to the Czech Philharmonic Orchestra. 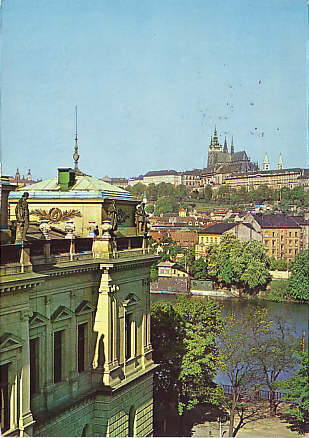 1918-1938 seat of the Czechoslovak Parliament. 1919-1920 interior rebuilding for parliament use by Václav Roštlapil, removal of the concert organ in favour of a parliament tribune. 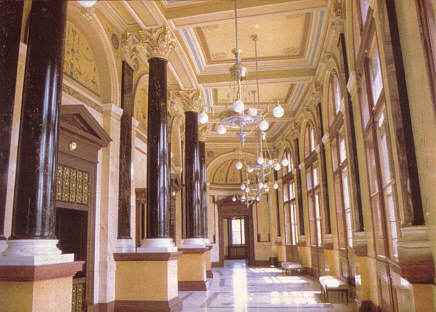 1922-1932 interior alterations by Rudolf Krízenecký. 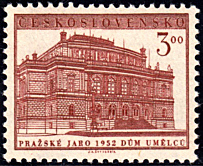 In the 1940s renovations and re-conversion to a concert hall by Antonín Engel and Bohumír Kozák. 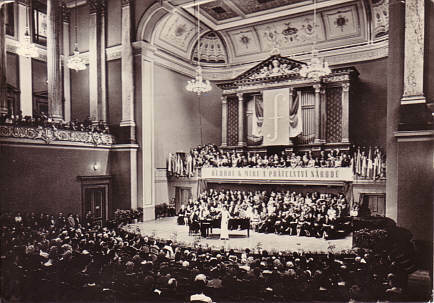 Installation of second concert hall, "Sukova sín", named in honour of the Czech composer and violinist, Josef Suk (1874-1935). 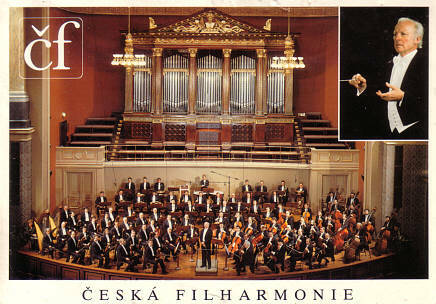 Subsequently, again home to the Czech Philharmonic Orchestra. Gallery tract used by the local Conservatory and the Academy of Performing Arts. 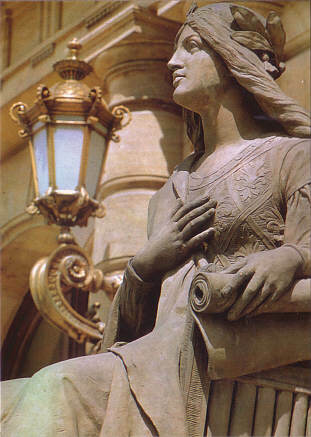 1990-1992 major restoration by Karel Prager. Subsequently again used as a concert hall and art gallery. Text: "Prazské jaro 1952 Dum umelcu"
Front Text: banner: "Hubdou k Míru a Prátelsví Národú"
Reverse Text: "Prazské jaro - Prachskaya vesna - Prager Frühling - Prague Spring - Printemps de Prague, Dum umelcu, Dom radotnikov iskusstv, Haus der Künstler, The House of Artists, Maison des Artists"
Reverse Text: "Prazské jaro - Prachskaya vesna - Prager Frühling - Prague Spring - Printemps de Prague, Koncertni sín v Dome umelcu, Dom radotnikov iskusstv, Haus der Künstler, The House of Artists, Maison des artistes"
Reverse Text: "Praha, Dum umelcu, cenná novarenesancni architektura zl. 1876-84 podle na´vrhu J. Zitka a J. Schulze, slouzila nejdrive jako koncertni sin a borazama." 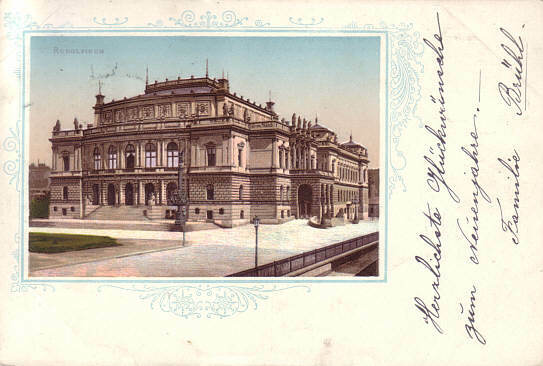 Reverse Text: "Praha - Hradcany - The castle of Prague Hradcany - Prager Burg Hradcany - Le Château de Prague Hradcany"
Front Text: "cf - Ceská Filharmonie"
Reverse Text: "Orchestr Ceská filharmonie v Rudolfinu, séfdirigent Gerd Albrecht"
Reverse Text: "Staré Mesto, Rudolfinum - Old Town, The Rudolfinum"
Reverse Text: "Rudolfinum, sídlo Ceské filharmonie"